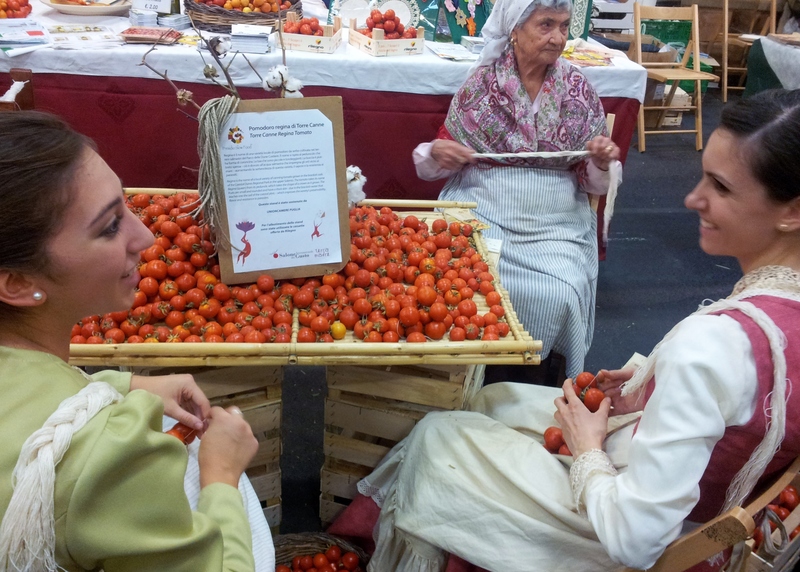 Salone del Gusto: so much food, so little time | Where's Zoe now? 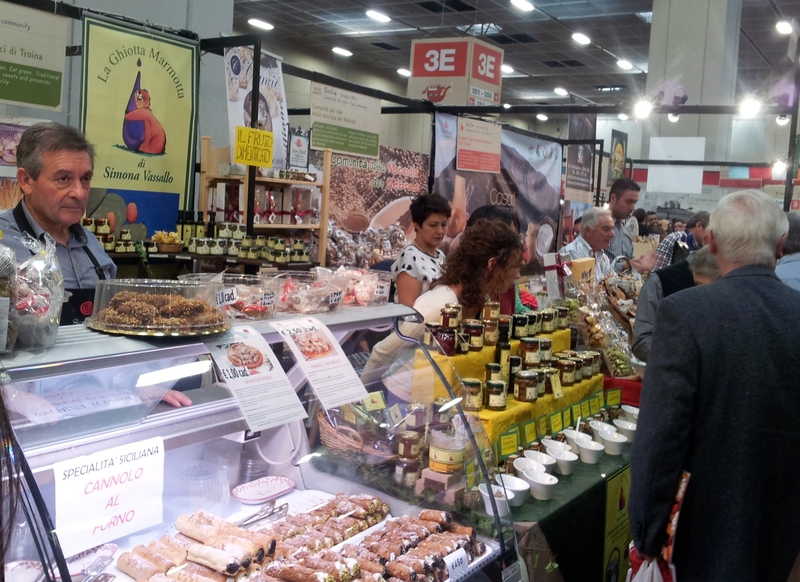 Salone del Gusto is a huge food exhibition/market/trade fair/convention held every 2 years in Torino. I went this weekend with a friend, somehow we managed nearly 5 hours of walking around, trying free samples and discovering new foods. It was good fun, but very tiring, so in lieu of some actual prose, here is a bullet-point summary. Things it reminded me of: the Perth Royal Show, if you only went to the dairy tent aka the best part of the show; a giant indoor market; the vendor exhibitions at physics conferences, except people are selling food rather than vacuum systems and atomic force microscopes. Flavour combinations I encountered that I never would have thought of myself: Tomato & vanilla; olive & orange; grappa-flavoured soft cheese. Things I wish I’d taken a photo of: the intricate, delicate bread sculptures from Sardinia, the marzipan fruits from Sicily, some of the traditional costumes people were wearing, especially in the International pavillion. Best stall: it’s a tough call, but there was a French cheese stall, with amazing goat cheeses, and the owners pretty much only gave samples to people who asked in French. Delicious cheese plus confirmation of stereotypes, oh yeah. Worst stall: The Australian one. (They were from Tasmania — another confirmation of stereotypes? Sorry…) They were just really disorganized. Maybe they were really, really, jetlagged? Purchases I’m glad I made: Stilton cheese from a very friendly stallholder from somewhere in the west of England who very much enabled my “oh but when will I next have the chance to buy stilton”; some kind of Lebanese cheese I forgot to ask the name of; a jar of fennel sauce/pesto/whatever-you’d-call-it. Purchases I regret: Juice from local juice bar — it was watery, like actual juice, I don’t think they had the “juice bar” concept quite down; a disappointing almond granita. Lesson learned: stick to things you can sample before buying! Purchases I regret not making: More cheese. Why did I not buy more cheese?! And canoli. I didn’t buy canoli because I find them really hit-or-miss, but in retrospect, I should have taken a risk. Three pieces of advice: 1. Dress smart — comfortable shoes for lots of walking, no tight waistbands. 2. If you’re thinking of buying from a stall but don’t want to lug around the cheese/wine/pickles/bag of onions/whatever, take a photo of the stall number, because you’ll never remember where it was later. 3. If at all possible, go during the week. It was packed on Saturday afternoon. Great for people-watching Torinesi from all walks of life get excited about food, bad for stress levels as you’re constantly in crowds. 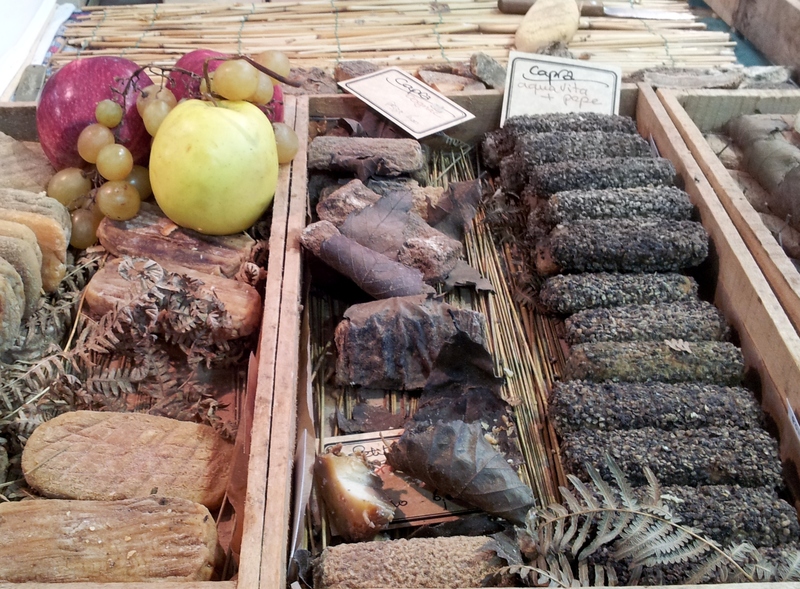 This entry was posted in Living in Turin and tagged food, salone del gusto on October 26, 2014 by Where's Zoe Now?. Pingback: I went to Salone del Gusto and the only photo I got was this taxidermy boar wearing sunglasses. (I am such a bad blogger.) | Where's Zoe now?